Challenges and opportunities facing Hispanic PR – In this interactive session, the discussions centered on how PR practitioners can strive for more diversity in the industry and encourage more young Hispanics to get into the industry. “The [public relations] industry as a whole struggles to find good PR practitioners who get PR, let alone Hispanics who get PR,” said Zandra Zuno, Executive Director and Multicultural Lead for Golin. 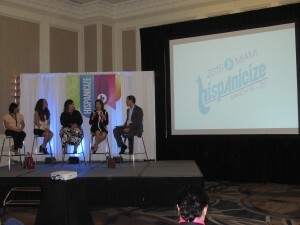 “If you don’t have the right people then progress overall won’t happen.” Some suggestions include encouraging young Hispanic PR hopefuls to seek out internships while in college, encourage mentorship programs through organizations like the Hispanic Public Relations Association, and to inspire a culture of family and understanding – key touch points of Hispanic culture. Hispanicize wraps up tonight with a concert by Gente de Zona at the legendary Fillmore theater in South Beach. Once again FCG Latino will be there so you don’t have to, so stay tuned.